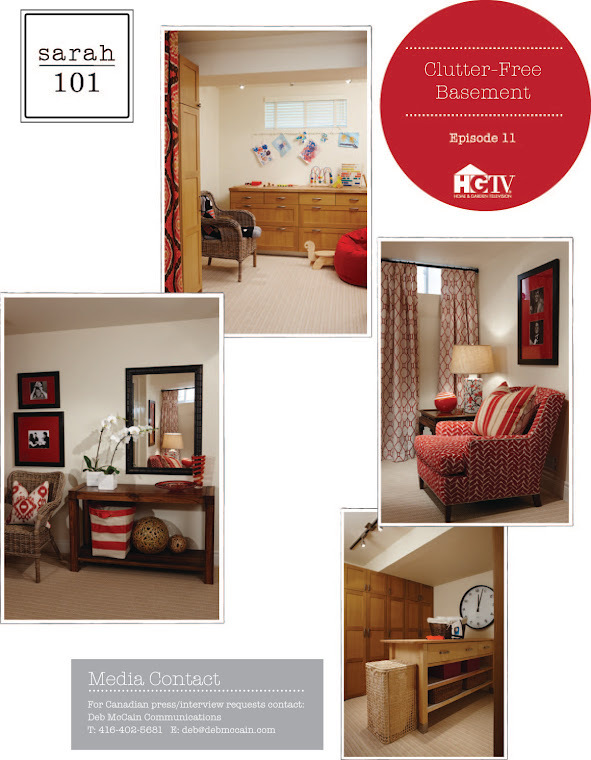 On today’s Sarah 101, Sarah and Tommy tackled a large cluttered basement and transformed it into an organized, multipurpose family space. Seeing as I will be transforming my own basement soon, I was curious to see if there were any great tips I could pick up from the talented twosome. 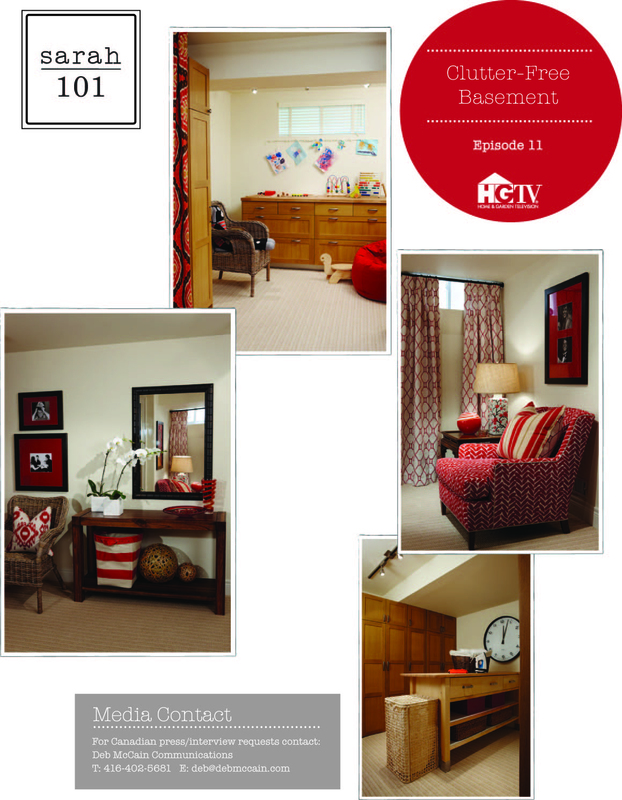 Like most basements, this one had to perform many functions with room for a play area for the kids, TV space for the family, and a storage and laundry area. Originally large and open, S&T maximized the utility of the space by dividing it back up. Freestanding cabinetry was used to create different zones. Two walls of Ikea cabinets defined the laundry area and provided needed storage space. Tall cabinets and a curtain wall marked the entry to the playroom. The unsightly and sometimes smelly storage area was enclosed in a separate room. With a good functional layout in place, Sarah used colour and furnishings to create a lively and inviting look. She mixed woods - light oak for the cabinets and warmer mahogany on the furniture – adding instant warmth. In an interesting move, the carpet only extended around the builtins (and not under them), making it easy to remove if there were a flood or staining. 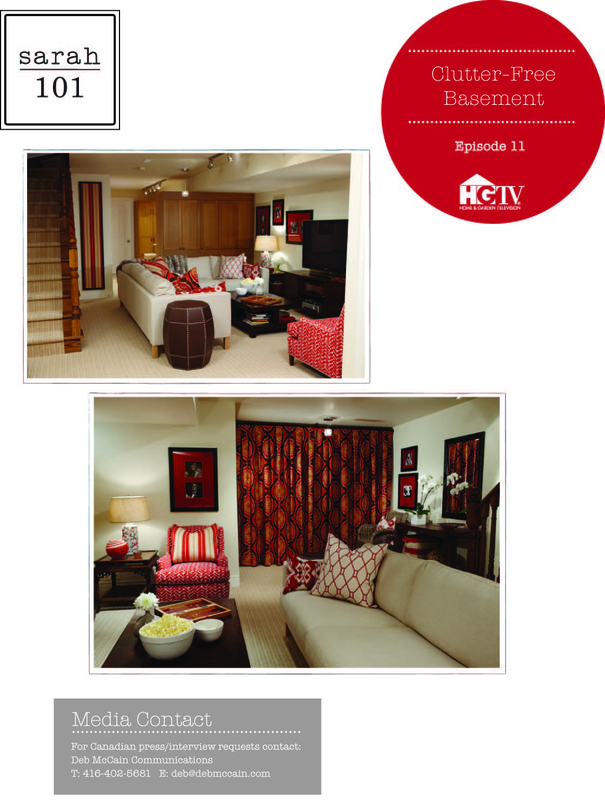 Punchy red was the colour of choice, showing up in draperies, picture frame mats, and upholstery. I loved most everything except playroom curtain, which seemed a bit adult and retro. To make a basement feel less like a basement Sarah said you need to treat it like an above-ground room; layer it with draperies, accessories, artwork, and softness. I think it worked because if this were my basement, I would spend all my time downstairs! - By using end cup mounts for drapes, they can be fully drawn all the way back. Add a centre ceiling mount for support. - Banish clutter by having no extraneous pieces. Have only what you need.